It’s the age old question: What’s better a three piece slate pool table or a one piece slate? Well, that all depends on who you’re asking. If you ask a bar or pub owner, they’ll tell you that they often have to move their coin operated pool tables around for special events. These coin-ops have a 3/4 inch one piece slate for this reason. Moving a pool table in one piece can really mess up the seams where the three pieces meet on a three-piece slate. But, these commercial pool tables are constructed differently. The cabinet holding the slate wraps and hugs the slate, so that even when the table is tilted on it’s side (experience required), it remains locked into place. When the pool table is put back into position final leveling is dialed in by commercial grade leg levelers. If you ask an Aramith Fusion Pool Table owner, they’ll tell you they love having a 3/4 inch one piece slate because it allows their pool table to lower to dining height, then raise again to playing height with a single click. These Fusion Tables, like the coin operated ones, have a special frame that holds the slate snug. These Fusions don’t really move around the room, but the up and down motion of the legs necessitate the one piece slate. If you ask an owner of a one piece slate furniture style pool table, they will likely give you a different reason. When they purchased the table (around 35 years ago), they were told that a one piece slate was far superior. A one piece slate has no seams to affect the playing field. It is a perfectly smooth surface all the way across. This is true, but remember that smooth doesn’t always equal level. If you’re asking me, a billiard mechanic with 24 years experience moving all types of pool tables, I’ll tell you it is a pain in the behind to struggle with a one piece slate. One piece slates weigh approximately 450 pounds. They are difficult to maneuver when refelting your pool table. They are more difficult to move through hallways, narrow doorways and corners. When there are stairs involved while moving a one piece slate, it is not just tricky, but downright dangerous carrying all of that weight. This is why it costs more to move or service these types of tables. I can also tell you that there is a performance downside to owning a one piece slate pool table. There is the issue of leveling the playing surface. Not all slate is perfect. There can be natural low or high spots in the stone. Especially on the bigger 8′ slate pieces. No amount of shimming or tweaking can remove these. Three piece slates tend to be at least 1/4″ thicker than their one piece cousins. Thicker slates have less imperfections and are usually permanently framed with pieces of wood to further support it when atop the pool table cabinet. Three and four piece slates start out as one piece, but are cut during the milling process. They are a matched set left to the billiard mechanic to level properly. Experienced mechanics must take great caution when leveling multiple pieces of slate. They must take into consideration the type of flooring and construction of the cabinet that will support all of the weight. A three piece slate, leveled properly, will without a doubt give you superior play. This is why the pros prefer to shoot on a three piece slate pool table as opposed to a one piece. I’d recommend a three piece slate over one solid slate if given the choice. But, remember, no matter the value, number of slates, or style of table, proper professional setup is key to getting the best possible roll. I was wondering if buying a table from the great escape is reliable. It’s a three piece slate, and I want to be sure if they install it it will be safe for the table. Keeping the table covered with heavy duty marine grade Naugahyde cover will keep cloth from fading. The only thing to bring color back is new cloth. Just ran across anAMF 9’ Playmaster Pool Table by the pics it looks in real good condition refelted a year ago. It’s selling for $600 is that a good deal? Or is it a normal price. How could I send you a pic? Yes Will, that’s a great table for the price. Sorry to hear that you’re scraping the 1 piece slate modified to 3 piece slate pool table but if you can get a 9 footer with less homework and headache more power to you! Hi Alex, if the pool table is a 1 piece slate then I’d say it is safe to use the methods you mentioned. If it is a 3 piece slate pool table the. You must be very careful about twisting the frame while moving it into and out of the trailer. Slow and steady should git er done! I’m picking up a 4 x 8 one piece 1” slate table. The frame looks like a basket case from the photo. My plan is to build a new table. I’m going to cut the slate into a three piece. I’ll be using a 7-1/4” worm drive skilsaw with a concrete diamond blade and a vacuum for dust and water cool if necessary. How do I prevent chipping? Any pointers? Hey Will, sounds like a pretty involved plan but as long as you keep the same wooden perimeter around your slate then you’ll be fine. You will loose some material when cutting the 2 seams but it should only amount to about an 8th of an inch. Now if you are thinking about building a 7ft pool table then I believe you’d have a lot more cutting to do but as long as you end up with 3 pieces of slate that overall measure 46×86 you’re good to go. Best of luck to you, PTK. My grandfather handed me down a 7ft bar table that was previously on a navy base, well while moving the one piece slate, we managed to break it and shatter it into pieces….. moving on …..is there anyway i can put a 3 piece slate on this table.to prevent the difficulty of moving a one piece slate? Hi Jason, sorry to hear about your mishap. Unfortunately what you want to do is not very feasible because on a bar table the slate needs to be removed from the box to refelt it. If it’s a standard 7 ft bar table slate (43″x83″) these are readily available for purchase. Best wishes, PTK. 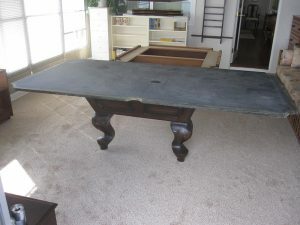 How much does 1 of the pieces of slate from a 7’ 3-piece slate AMF Playmaster table weigh? Also, is this a solid table? The one I’m looking at is $350. Yes Craig, AMF makes a very good home style pool table. One of the pieces on a 7 foot three piece slate pool table will weigh about 125 pounds. Best, PTK. I have an older 8ft imperial and I need to replace the slate. I’m not having luck finding websites, any recommendations? Is there a particular reason you need to replace the slate? Damaged slate can most times be fixed. Please contact us directly if you are in the Orange County Area. Or, contact your local Billiards Store to purchase slate. I am wanting a 8 or 9 ft table for my new man cave. Can you tell me if a second floor that has 25foot. 14in OSB joists (16in apart on center) is strong enough to support it and a few guys near it? Only asking because I have heard yes and no, you need a support beam down the center. I’d consult a contractor. There’s a bit of difference in weight between an 8 and 9 foot table, but some tables can weigh 1000 lbs. It’s going to depend on the frame, slate thickness and size of a “few guys”. We are pool table experts, not architects. 😉Best of luck! Hi, I’m trying to buy back the pool table our family had when I was a kid. I’m quite sure it’s a brunswick gold crown 8 or 9 ft 1 piece slate. The seller is pretty much giving it to me, but my first quote to have it moved was $1500. Does that seem reasonable? I’m trying to get a second quote, and this company is insisting it’s not a 1 pc, but I know it is. The $1500 quote company seems very knowledgeable. The guy stated he is a Brunswick certified master technician, and explained the reason behind the price very thoroughly. Hi Mike, if it’s a Brunswick gold crown it’s not a 1 piece slate. $1500 for moving a 3pc slate sounds about $1000 too much unless there are a lot of stairs involved. However if for some reason you have a one piece slate pool table then moving costs go up and especially when there are stairs to deal with. I’ve got a Minnesota Fats 8′ that’s got slatron, which looks like laminated countertop under my felt. Is it possible to get slate or fit 3 piece slate onto this table? 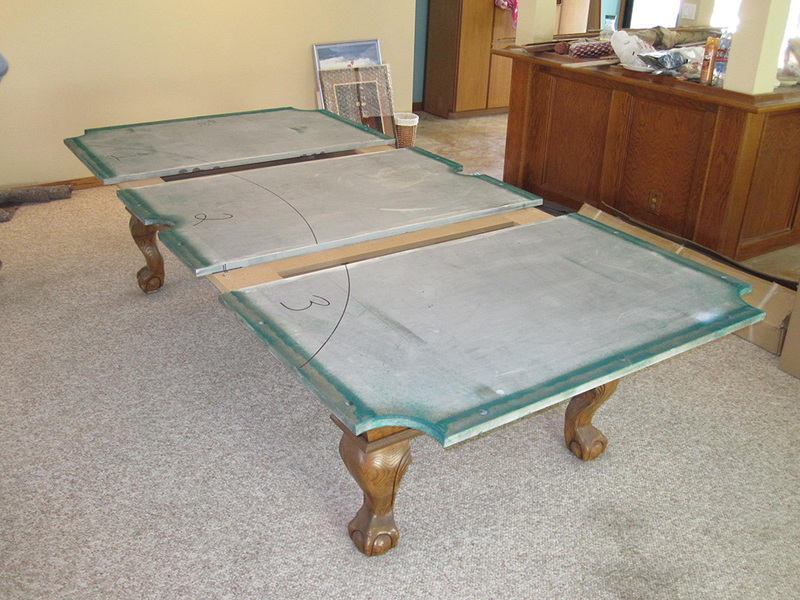 The longer answer: Non-slate pool tables are usually not constructed to withstand the weight of real slate. Trying to strengthen the table to accept slate likely would not be cost-effective. Place your time and effort into saving cash for a new or gently used slate pool table. I have a late ’30’s / early ’40’s Brunswick 20th Century table, 8′, 3 piece slate, in pretty nice condition. Do you think that $1k is too high an asking price? I think that’s a very fair price. Tammy, great question. Hopefully this pool table is in a room with doors that are wider than 56 inches and there are no steps along the exit route. On the receiving end you will need the same prerequisite in order to move a pool table without disassembling it. My best advice to you would be to break down the pool table before moving it. For more info on how to move a pool table you can visit the FAQ section on my website. Good luck, PTK. Shauna, have you tried searching Brunswick Billiards website? I have never heard of this model pool table before. Best, PTK. Yes Bill, as long as you jack the pool table from the side of the frame just high enough to slip a dollie underneath each leg and repeat this for the other side. Please take care, PTK. Hay im going to go move a 2 pice skate pool table with my dad its 4ft by 8ft and has 4 legs we are using a truck and some tie downs we are also going to take some tools to remove legs and parts off the table dose anyone know what tools you need to remove the legs and rails? To the best of my knowledge all Fischer pool tables made before the 1980’s are one piece slate. Would you happen to know where i could sell my one peice slates and at what price would you recommend? Sorry Lee, the only one piece slate that has any real value would be a 43×83 inch as this size is typically used in 7 foot coin-op pool tables. If this is what you have I’d say it is worth $150 in excellent condition. Hi Chris, yeah that’s happened to me before. What I’ve done is to tap into a few hardwood wedge in between the slates. Make sure you space theM out a bit and be careful when you hammer them in so that you don’t Crack the slate. Do a little at a time should be fine. I’ll give it a shot…. Murrey, not Murray. Slate table, three piece slate. Not cheap. Do not move in one piece. Shifting a 8×4 on friday about 40 miles, we will be using a car transporting trailer with tyres underneath for support. Is this a feasible way of moving a 1 pce slate table. It will be held down with ratchet straps. hello marc, are you just removing the legs from the base frame? Yeah mate, has 6 legs, will lay it flat on tyres, got 4 blokes organised for the lift, does it sound ok? Well Marc, how did it go? Yeah mate, all good, the tyres work a treat, have played about 50 games so far and it rolls perfectly. The cushions will need to be refurbished but apart from that, its all sweet as bro, cheers for the help? We consider tables pre-1950’s to be antique. But, antiques from the late 1800’s to early 1900’s typically require special care and tools. There are also antique replicas with more modern reproduction dates. Pingback: Moving a 1 piece slate pool table | Move a Pool Table?